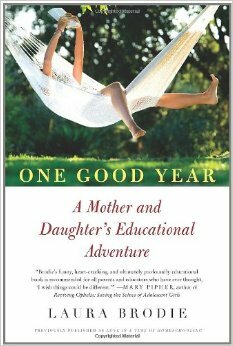 I was eager to read this memoir about homeschooling, being that I have recently waded into the homeschooling waters myself. Ten years ago, Laura Brodie decided to pull her ten-year old daughter, Julia, from public school in order to homeschool her. The decision was made after much contemplation, and was based on Julia’s social, academic, and emotional difficulties with what seemed to be the institutionalized school setting itself. A free spirit who related to animals better than humans, who bristled at the confinement of school, and whose mind tended to withdraw and wander to such an extent that focusing on schoolwork was a real problem, Laura decided to give her daughter a respite for her fifth grade year. She hoped that a change of scenery for a year would give Julia a chance to regroup, refuel, and prepare for middle school. There were certainly things in Brodie’s contemplation of homeschooling that I could relate to. This very much sums up my decision to pull my own daughter from public school in order to homeschool her; the misery school was causing her wasn’t worth whatever benefits she was supposedly getting from the experience, and I finally decided to take matters into my own hands in the hope that I could turn things around for her. I didn’t get very far into the book, however, before I found myself irritated with the author. She scoffs at the propensity of parents to “grasp at straws of genius” in their children, but seems oblivious to her own tendency to do the same. All three of her daughters are above average, apparently – at least in the author’s eyes. And although I can’t locate the quote now, I believe her other daughter, Kathryn, was deemed “bored” with the academic aspect of school because she was so bright. And, of course, Julia is a better violinist than any of her peers taking violin lessons. It seemed to me that trouble started brewing as soon as Brodie and her daughter began that year of homeschooling. When she describes how, “She and I had agreed that if her sisters were going to attend school from 8:30 to 3:00 every day, she would follow a similar routine . . . For the sake of sibling equality, we would find activities to fill six and a half hours each day,” it struck me how oblivious she seemed to the utter arbitrariness of a six-and-a-half hour school day, and the fact that much of that time is spent on classroom management and paper shuffling in “regular” school, and not on actual learning. And what about meeting each child’s individual needs? If she was going to base their school days on “sibling equality,” it seemed to me something important would be lost – namely, the meeting of Julia’s unique needs. From the very beginning, Brodie sets stringent expectations for Julia, and from almost the beginning, tempers flare and mother and daughter clash again and again. I wanted so badly to see Brodie just stop and take a deep breath and change tack – and eventually she does, sort of, but not until the spring when their year together is already drawing to a close. Ten years later, I wonder what Julia would say about her homeschooling experience; I wonder how she feels that it benefited her, how it impacted her return to public school through her completion of high school, and how she feels it affected her relationship with her mother. Still, the writing and the author seem to lack a measure of warmth, and that kept me at arm’s length. Ultimately, I thought the title of this book to be misleading, because it doesn’t seem like their year of homeschooling was good; in the end, I see it as more a cautionary tale than anything else.